Rolling Loud has announced the 2019 lineup for its Miami edition, which goes down May 10-12 at Hard Rock Stadium. 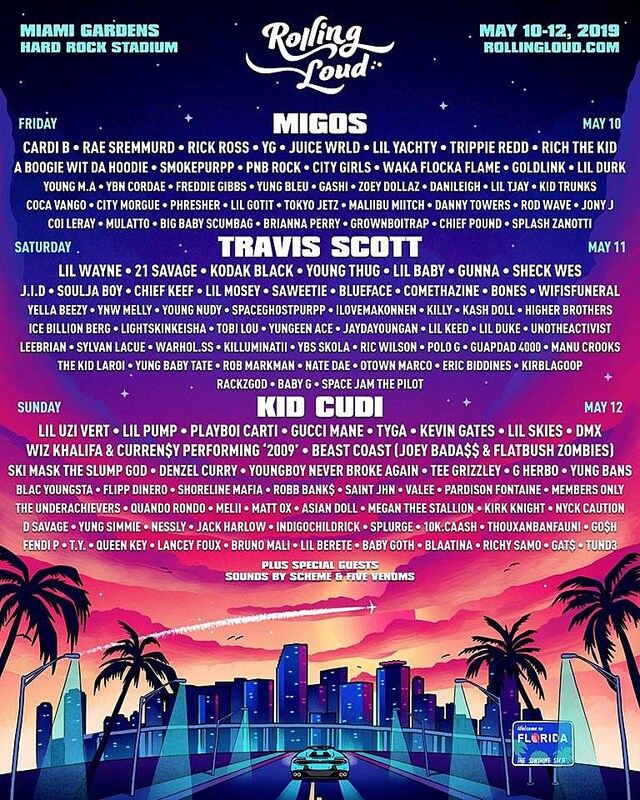 The headliners are Migos, Travis Scott, and Kid Cudi, and the lineup also includes Cardi B, Rae Sremmurd, Lil Wayne, Rick Ross, YG, 21 Savage, Young Thug, Lil Uzi Vert, Lil Pump, Playboi Carti, Gucci Mane, Tyga, Sheck Wes, Kevin Gates, A Boogie Wit Da Hoodie, JID, Soulja Boy, City Girls, Waka Flocka Flame, GoldLink, Young M.A, YBN Cordae, Freddie Gibbs, Chief Keef, Blueface, iLoveMakonnen, DMZ, Wiz Khalifa + Curren$y (performing ‘2009’), Beast Coast (Joey Bada$$ + Flatbush Zombies), Denzel Curry, YoungBoy Never Broke Again, Tee Grizley, G Herbo, Shoreline Mafia, Valee, Members Only, The Underachievers, Asian Doll, Kirk Knight, Nyck Caution, Maliibu Miitch, Queen Key, and more. Tickets go on sale Friday (2/1) at 10 AM. Full lineup on the poster above.